Continuing my new “Adventures in LIVE Streaming” (just in case you didn’t catch it on Twitter/Periscope) was a visit earlier this month to the Sofitel Los Angeles for a presentation of Les Demoiselles of Cabaret Versatile, Le Caberet a la Mode de Paris. What really should be taking place on a larger stage a la Moulin Rouge, is a very up close and cinematic-like view for the audience of French Cancan, cheeky Burlesque, effervescent humor and le chant très sensuelle. The premiere of Femmes at Riviera 31, is a dreamy, glamorous and immersive sampling of all things feminine and female. I’d also add definitively–all things French. We especially loved being treated chez chic champagne and macaroons while sensually embraced by the ambiance and sensational elegance. With the Hollywood Fringe Festival fast approaching it is interesting to note that these ladies actually received an award for Best Cabaret and Variety Show, and were nominated for Best International Show at Fringe back in 2012. Their return is nothing short of breathtaking. 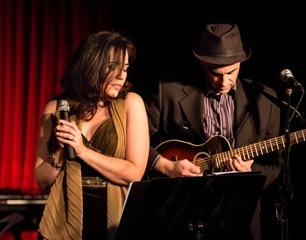 Opening act, singers Julia and Jacob of Paris Chansons, immediately set a warm, nostalgic tone with favorite tunes and sing-a-longs in French and English most recognizable to the highly percentiled Français crowd in attendance. For the rest of us, it was a ticklish treat. Headlining the show was actress Mhairi Morrison appearing as her ever-in-a-fuss character Talullah Grace, who hilariously and quite decadantly clowned up what would have otherwise been moments of unfortunate trevas in between each number. The intermission is overly long. But you can square away the tedium quite nicely at the fully stocked, ready and delicious bar at Riviera 31.